The trekkers of the April 2017 Snow Leopard Heli-Trek held a fundraising dinner for HDFA at Taste of Nepal Restaurant on The Parade at Norwood. An amazing $5,892 was raised on the night from ticket sales and generous gifts for the silent auction. Trekkers, their family and friends enjoyed an amazing selection of delicious Nepali food accompanied by wine kindly donated by CMV Farms. 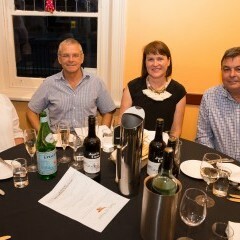 With over 20 items in the silent auction, happy guests walked away with holidays to the Barossa and Kangaroo Island, tickets to watch the Crows, cooking items, hair pampering and products, car servicing and plenty of wine. The night was a wonderful success and we could not have achieved what we did without generous sponsors, bidders and donors. Many thanks to – The Harrold Family, Sealink, CMI Toyota, Routleys, StevenProfessional Hairdressing, Lexus of Adelaide, Mercedes Benz Adelaide, Harrold & Kite Pty Ltd, Peter Weeks and Lisa Herbst, Alan Dean, Richard and Jette Hamilton, David and Nicole Crawford, Taste of Nepal and PhotoJo. On behalf of HDFA, we would like to thank all those who supported this fundraising dinner. 100% of funds raised on the night and any additional donations received, go entirely to HDFA, and will continue to provide an English and Tibetan teacher for the Ghunsa school, so thanks from the children.